Navisworks Simulate and Manage 2016, AutoCAD 2016, AutoCAD Civil 3D 2016, Autodesk Plant Design Suite 2016, InfraWorks 360, Autodesk Recap 2016,The Autodesk Revit 2016 Product Page provides a summary of Revit 2016 New Features for architecture, engineering, construction and and subscription users. View images and videos to see how Revit® software delivers Building Information Modeling (BIM) tools for architectural design, MEP engineering, structural engineering, and construction, and enables coordination between disciplines. Revit 2016 and AutoCAD 2016 will be the last versions offered with Perpetual Licensing for Stand-Alone Desktop Software. Autodesk Software Licensing for standalone desktop software will transition from perpetual licensing to desktop subscription licensing on February 1, 2016. The details of Autodesk Suite licensing are outlined in this article. 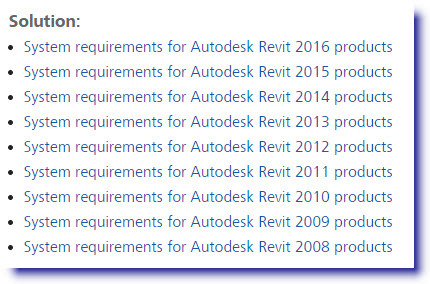 The Autodesk Revit System Requirements Page has been updated for Revit 2016. Download Revit 2016 30-Day Trial Software Page or Go to your Autodesk Subscription Website \ Download Your Revit 2016 Update. View Autodesk Revit LT 2016 Comparison Feature Chart between Revit Building Design Suites 2016 and Autodesk Revit LT 2016. We'll post additional Revit 2016 Product Reviews and Videos links in this article; as they become available. In August 2014, What Revit Wants published an extensive list of Revit 2016 features for the Revit Sundial (cloud-hosted) software. Compare this list to the final Revit 2016 New Features.